Tags: Astronomy ( 7,563 ), Basic Research ( 10,460 ), Ethan Siegel ( 232 ), Spacetime ( 7 ), Starts with a Bang, Why must time be a dimension? 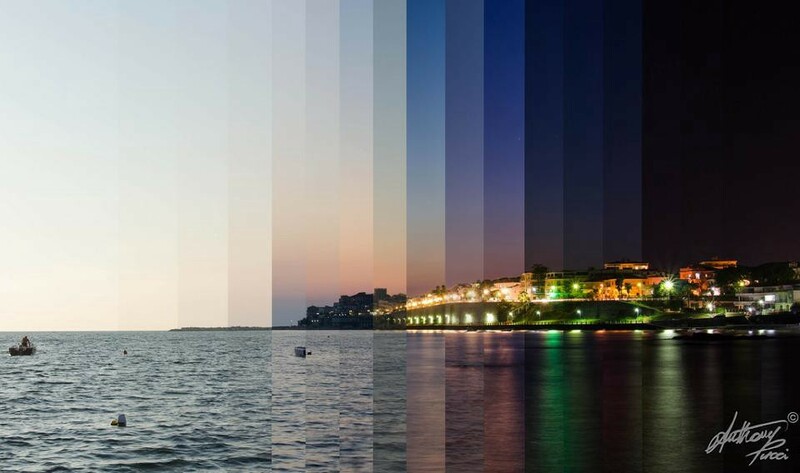 A time-lapse photo like this composition reminds us that photographs are normally snapshots of locations at particular moments, with each moment distinct and unique from the last. Image credit: flickr user Anthony Pucci. Sure, we move through it just like space, but it was the aftermath of Einstein that led to us truly understanding it. Let’s start by looking at the three dimensions of space you’re familiar with. Here on the surface of the Earth, we normally only need two coordinates to pinpoint our location: latitude and longitude, or where you are along the north-south and east-west axes of Earth. If you’re willing to go underground or above the Earth’s surface, you need a third coordinate — altitude/depth, or where you are along the up-down axis — to describe your location. After all, someone at your exact two-dimensional, latitude-and-longitude location but in a tunnel beneath your feet or in a helicopter overhead isn’t truly at the same location as you. It takes three independent pieces of information to describe your location in space. Your location in this Universe isn’t just described by spatial coordinates (where), but also by a time coordinate (when). Image credit: Pixabay user rmathews100. But spacetime is even more complicated than space, and it’s easy to see why. The chair you’re sitting in right now can have its location described by those three coordinates: x, y and z. But it’s also occupied by you right now, as opposed to an hour ago, yesterday or ten years from now. In order to describe an event, knowing where it occurs isn’t enough; you also need to know when, which means you need to know the time coordinate, t. This played a big deal for the first time in relativity, when we were thinking about the issue of simultaneity. Start by thinking of two separate locations connected by a path, with two people walking from each location to the other one. Two points connected by a 1-dimensional (linear) path. Image credit: Wikimedia Commons user Simeon87. You can visualize their paths by putting two fingers, one from each hand, at the two starting locations and “walking” them towards their destinations. At some point, they’re going to need to pass by one another, meaning your two fingers are going to have to be in the same spot at the same time. In relativity, this is what’s known as a simultaneous event, and it can only occur when all the space components and all the time components of two different physical objects align. This is supremely non-controversial, and explains why time needs to be considered as a dimension that we “move” through, the same as any of the spatial dimensions. But it was Einstein’s special theory of relativity that led his former professor, Hermann Minkowski, to devise a formulation that put the three space dimensions and the one time dimension together. We all realize that to move through space requires motion through time; if you’re here, now, you cannot be somewhere else now as well, you can only get there later. In 1905, Einstein’s special relativity taught us that the speed of light is a universal speed limit, and that as you approach it you experience the strange phenomena of time dilation and length contraction. But perhaps the biggest breakthrough came in 1907, when Minkowski realized that Einstein’s relativity had an extraordinary implication: mathematically, time behaves exactly the same as space does, except with a factor of c, the speed of light in vacuum, and a factor of i, the imaginary number √(-1). An example of a light cone, the three-dimensional surface of all possible light rays arriving at and departing from a point in spacetime. Image credit: Wikimedia Commons user MissMJ. Putting all of these revelations together yielded a new picture of the Universe, particularly as respects how we move through it. If you’re completely stationary, remaining in the same spatial location, you move through time at its maximal rate. The faster you move through space, the slower you move through time, and the shorter the spatial distances in your direction-of-motion appear to be. And if you were completely massless, you would move at the speed of light, where you would traverse your direction-of-motion instantaneously, and no time would pass for you. A stationary observer sees time pass normally, but an observer moving rapidly through space will have their clock run slower relative to the stationary observer. Image credit: Michael Schmid of Wikimedia Commons. From a physics point of view, the implications are astounding. It means that all massless particles are intrinsically stable, since no time can ever pass for them. It means that an unstable particle, like a muon created in the upper atmosphere, can reach the Earth’s surface, despite the fact that multiplying its lifetime (2.2 µs) by the speed of light yields a distance (660 meters) that’s far less than the distance it must travel. And it means that if you had a pair of identical twins and you left one on Earth while the other took a relativistic journey into space, the journeying twin would be much younger upon return, having experienced the passage of less time. Having your camera anticipate the motion of objects through time is just one practical application of the idea of time-as-a-dimension. The remarkable thing is that anyone, regardless of their motion through space relative to anyone else, will see these same rules, these same effects and these same consequences. If time weren’t a dimension in this exact way, the laws of relativity would be invalid, and there might yet be a valid concept such as absolute space. We need the dimensionality of time for physics to work the way it does, and yet our Universe provides for it oh so well. Be proud to give it a “+1” in all you do. Einstein called it spooky, but if we figure it out right, can we learn about distant star systems instantaneously? It’s a long shot, but could quantum entanglement be used for communication? Imagine you have two coins, where each one can turn up either heads or tails. You have one and I have one, and we’re located extremely far away from each other. We each toss them up in the air, catch them, and slap them down on the table. When we reveal the flip, we fully expect that there’s a 50/50 chance that each one of us will uncover a “heads” result and a 50/50 shot we’ll each get a “tails.” In the normal, unentangled Universe, your results and my results are completely independent of one another: if you get a “heads” result, there’s still a 50/50 shot for my coin to either display “heads” or “tails.” But under some circumstances, these results could be entangled, meaning that if we do this experiment and you get a “heads” result, you’ll know with 100% certainty that my coin is displaying “tails,” even before I told you. You’d know it instantaneously, even if we were separated by light years and not even a single second had passed. The quantum mechanical Bell test for half-integer spin particles. Image credit: Wikimedia Commons user Maksim, under a c.c.a.-s.a.-3.0 license. In quantum physics, we normally entangle not coins but individual particles like electrons or photons, where, for example, each photon can have a spin of either +1 or -1. If you measure the spin of one of them, you instantaneously know the spin of the other, even if it’s halfway across the Universe. Until you measure the spin of either one, they both exist in an indeterminate state; but once you measure even one, you immediately know both. We’ve done an experiment on Earth where we’ve separated two entangled photons by many miles, measuring their spins within nanoseconds of one another. What we find is that if we measure one of them to be +1, we know the other to be -1 at least 10,000 times faster than the speed of light would enable us to communicate. So now to Olivier’s question: could we use this property — quantum entanglement — to communicate from a distant star system to our own? The answer to that is yes, if you consider making a measurement at a distant location a form of communication. But when you say communicate, typically you want to know something about your destination. You could, for example, keep an entangled particle in an indeterminate state, send it aboard a spacecraft bound for the nearest star, and tell it to look for signs of a rocky planet in that star’s habitable zone. If you see one, make a measurement that forces the particle you have to be in the +1 state, and if you don’t see one, make a measurement that forces the particle you have to be in the -1 state. Artist’s impression of a sunset from the world Gliese 667 Cc, in a trinary star system. Image credit: ESO/L. Calçada. Therefore, you reason, the particle you have back on Earth will then either be in the -1 state when you measure it, telling you that your spacecraft found a rocky planet in the habitable zone, or it will be in the +1 state, telling you that it didn’t find one. If you know the measurement has been made, you should then be able to make your own measurement, and instantly know the state of the other particle, even if it’s many light years away. The wave pattern for electrons passing through a double slit. If you measure “which slit” the electron goes through, you destroy the quantum interference pattern shown here. Image credit: Dr. Tonomura and Belsazar of Wikimedia Commons, under c.c.a.-s.a.-3.0. It’s a brilliant plan, but there’s a problem: entanglement only works if you ask a particle, “what state are you in?” If you force an entangled particle into a particular state, you break the entanglement, and the measurement you make on Earth is completely independent of the measurement at the distant star. If you had simply measured the distant particle to be +1 or -1, then your measurement, here on Earth, of either -1 or +1 (respectively) would give you information about the particle located light years away. But by forcing that distant particle to be +1 or -1, that means, no matter the outcome, your particle here on Earth has a 50/50 shot of being +1 or -1, with no bearing on the particle so many light years distant. A quantum eraser experiment setup, where two entangled particles are separated and measured. No alterations of one particle at its destination affect the outcome of the other. Image credit: Wikimedia Commons user Patrick Edwin Moran, under c.c.a.-s.a.-3.0. Quantum teleportation, an effect (erroneously) touted as faster-than-light travel. In reality, no information is being exchanged faster than light. Image credit: American Physical Society, via http://www.csm.ornl.gov/SC99/Qwall.html. If quantum mechanics hasn’t profoundly shocked you, you haven’t understood it yet. The Universe plays dice with us all the time, much to Einstein’s chagrin. But even our best attempts to cheat at the game are thwarted by nature itself. If only all referees and umpires were as consistent as the laws of quantum physics! How does dark matter interact with black holes? Does it get sucked into the singularity like normal matter, contributing to the mass of the black hole? If so, when the black hole evaporates through Hawking radiation, what happens to [it]? This is a great question, and it all starts with what black holes actually are. Here on Earth, if you want to send something into space, you need to overcome the Earth’s gravitational pull. For our planet, what we call “escape velocity” is somewhere around 25,000 mph (or 11.2 km/s), which we can achieve with powerful rocket launches. If we were instead on the surface of the Sun, the escape velocity would be much greater: about 55 times as great, or 617.5 km/s. When our Sun dies, it will contract down to a white dwarf, of about 50% the Sun’s current mass but only the physical size of Earth. In this case, its escape velocity will be about 4570 km/s, or about 1.5% the speed of light. This is important, because as you concentrate more and more mass into a particular region of space, the speed required to escape this object gets closer and closer to the speed of light. And once your escape velocity at the object’s surface reaches or exceeds [?] the speed of light, it isn’t just that light can’t get out, it’s required that — at least as we understand matter, energy, space and time today — everything within that object collapse down to a singularity. The reason is simple: all the fundamental forces, including the forces that hold atoms, protons, or even quarks together, can move no faster than the speed of light. So if you’re at any point away from a central singularity and you’re trying to hold a more distant object up against gravitational collapse, you can’t do it; collapse is inevitable. And all you need to crest past this limit in the first place is a star more massive than about 20-40 times the mass of our Sun. When it runs out of fuel in its core, the center will implode under its own gravity, creating a catastrophic supernovae, blowing off and destroying the outer layers but leaving a black hole at the center. These “stellar mass” black holes, somewhere in the neighborhood of 10 solar masses, will grow over time, consuming any matter or energy that dares to venture too close to it. Even if you move at the speed of light when you fall in, you’ll never get out again. Due to the extreme curvature of space inside, you’ll inevitably encounter the singularity at the center. When that happens, all you do is add to the energy of the black hole. From the outside, we can’t tell whether a black hole was initially made up of protons and electrons, neutrons, dark matter or even antimatter. There are — as far as we can tell — only three properties that we can observe about a black hole from outside of it: its mass, its electric charge and its angular momentum, which is a measure of how fast it’s spinning. Dark matter, as far as we know, has no electric charge, nor does it have any of the other quantum numbers (color charge, baryon number, lepton number, lepton family number, etc.) that may or may not be conserved or destroyed as pertains to the black hole information paradox. Illustration credit: ESA, retrieved via http://chandra.harvard.edu/resources/illustrations/blackholes2.html. Because of how black holes are formed (from the explosions of supermassive stars), when they’re first formed, black holes are pretty much 100% normal (baryonic) matter, and just about 0% dark matter. Remember that dark matter interacts only gravitationally, unlike normal matter, which interacts via the gravitational, weak, electromagnetic and strong forces. Yes, there’s perhaps five times as much dark matter total in large galaxies and clusters as there is normal matter, but that’s summed up over the entire huge halo. In a typical galaxy, that dark matter halo extends for a few million light years, spherically, in all directions, while the normal matter is concentrated in a disk that’s just 0.01% the dark matter’s volume. … but the baryonic mass — the normal matter — of what would be inside our sphere would be dominated by our Sun, and would weigh about 2 × 10^30 kg. On the other hand, the total amount of dark matter in that same sphere? Only about 1 × 10^19 kg, or just 0.0000000005% the mass of the normal matter in that same region, or about the mass of a modest asteroid the size of Juno, approximately 200 km across. Over time, dark matter and normal matter both will collide with this black hole, getting absorbed and adding to its mass. The vast majority of black hole mass growth will come from normal matter and not dark matter, although at some point, many quadrillion years into the future, the rate of black hole decay will finally surpass the rate of black hole growth. The Hawking radiation process results in the emission of particles and photons from outside the black hole’s event horizon, conserving all the energy, charge and angular momentum from the black hole’s insides. This process may take anywhere from 10^67 years (for a solar mass black hole) to 10^100 years (for the most massive multi-billion solar mass black holes), but eventually what comes out is a mix of everything that’s possible. This means that some dark matter will come out of black holes, but that’s expected to be completely independent of whether a substantial amount of dark matter went into the black hole in the first place. All a black hole has memory of, once things have fallen in, is a small set of quantum numbers, and the amount of dark matter that went into it isn’t one of them. What comes out isn’t going to be the same as what you put in! Image credit: E. Siegel, on the quantum origin of Hawking Radiation. So at the end of the day, dark matter is just another food source for black holes, and not a very good one at that. Even worse: it’s not even an interesting source of food. What black hole “sees” is no different than shining a flashlight into a black hole and having your photons absorbed until, via E=mc^2, you’ve put in as much energy as there is mass in the dark matter that fell in. No other types of charge exist in dark matter, and other than the angular momentum from falling in off-center (which applies to photons, too), there’s no other effect on black holes at all, either going in or coming out. 13.8 billion years is a great number. But how sure are we of this, and how did we get there? In an ideal world, when we want to uncover the answer to a question like “what is the age of the Universe,” we’d have an incredible number of independent lines of evidence, all converging to the same answer. But in reality, there are only two good ones, and one is better than the other. The “good” one is to think about the fact that our Universe is expanding and cooling today, and to recognize that it was therefore hotter and denser in the past. If we go back, to earlier and earlier times, we’d find that as the volume of the Universe was smaller, all the matter in it was not only closer together, but that the wavelengths of all the individual photons (particles of light) in it were shorter, as the Universe’s expansion has lengthened them to be as long as they are today. Since a photon’s wavelength defines its energy and temperature, a shorter-wavelength photon is more energetic and higher in temperature. As we go back farther and farther in time, the temperature goes up and up, until at some point, we reach the earliest stages of the hot Big Bang. This is important: there is an “earliest stage” for the hot Big Bang! If we were to extrapolate “infinitely” far back, we’d reach a singularity, where physics breaks down. With our modern understanding of the very early Universe, we know that an inflationary state preceded the hot, dense Big Bang, and that inflationary state was of an indeterminate duration. So when we speak of “the age of the Universe,” we’re talking about how much time has past since the Universe could first be described by the hot Big Bang until the present day. Inflation to gravitational waves derived from ESA/Planck and the DOE NASA NSF interagency task force on CMB research, Bock et al. (2006, astro-ph/0604101); modifications by E. Siegel. then there is a unique connection between how old the Universe is and how it’s expanded throughout its history. From direct measurements of the brightnesses and distances of objects in the Universe such as stars, galaxies and supernovae, allowing us to construct the cosmic distance ladder. From measurements of large-scale-structure, the clustering of galaxies, and from baryon acoustic oscillations. And from the fluctuations in the cosmic microwave background, a “snapshot” of the Universe when it was a mere 380,000 years old. You put all of these things together, and you get a Universe that is made up, today, of 68% dark energy, 27% dark matter, 4.9% normal matter, about 0.1% neutrinos, about 0.01% radiation, and pretty much nothing else. But you throw in how the Universe is expanding today, and we can extrapolate this back in time, and learn the entire expansion history of the Universe, and hence, its age. The different energy components of the Universe and when/how they matter. Image credit: E. Siegel. The number we get — most precisely from Planck but augmented from the other sources like supernova measurements, the HST key project and the Sloan Digital Sky Survey — is that the Universe is 13.81 billion years old, with an uncertainty of just 120 million years. This means we’re confident in the age of the Universe to 99.1% accuracy, which is an amazing feat! Yes , we have a number of different data sets that point to this conclusion, but in reality, it’s all the same method. We’re simply fortunate that there is a consistent picture that they all point towards, but in reality, any one of the constraints themselves is insufficient to say “this is exactly how the Universe is.” Instead, they all offer a variety of possibilities, and it’s only their intersection that tells us where we live. Image credit: Suzuki et al. (The Supernova Cosmology Project), accepted for publication, Ap.J., 2011., via http://supernova.lbl.gov/Union/. If the Universe had the same current properties today but were made of 100% normal matter and no dark matter or dark energy, our Universe would be only 10 billion years old. If the Universe were 5% normal matter (with no dark matter or dark energy) and the Hubble constant were 50 km/s/Mpc instead of 70 km/s/Mpc, our Universe would be a whopping 16 billion years old. With the combinations of things we have today, however, we can confidently state 13.81 billion years is the age of the Universe, with a very small uncertainty. It’s an incredible feat of science. And yet, all of that is legitimately just one method. It’s the main one, it’s the best one, it’s the most complete one, and it’s got a ton of different pieces of evidence pointing towards it. But there is another, and it’s incredibly useful for checking our results. Image credit: Joel D. Hartman, Princeton University, via http://www.astro.princeton.edu/~jhartman/M3_movies.html. It’s the fact that we know how stars live, burn through their fuel, and die. In particular, we know that all stars, when they’re alive and burning through their main fuel (fusing hydrogen into helium), have a specific brightness and color, and remain at that specific brightness and color only for a certain amount of time: until their cores start to run out of fuel. At that point, the brighter, bluer and higher mass stars begin to “turn off” of the main sequence (the curved line on the color-magnitude diagram, below), evolving into giants and/or supergiants. Images credit: Richard Powell under c.c.-by-s.a.-2.5 (L); R. J. Hall under c.c.-by-s.a.-1.0 (R). Globular cluster Messier 10, as imaged with the Hubble Space Telescope. Image credit: ESA/Hubble & NASA. So all in all, we have two methods — one from our cosmic history and one from measuring local stars — that show us our Universe’s age is between 13 and 14 billion years old. It wouldn’t surprise anyone if we turned out to be as little as 13.6 or as much as 14.0 billion years old, or maybe even as little as 13.5 or as much as 14.1 billion. But we’re not 13.0 or 15.0 billion years old, and we’ve determined that with extreme certainty. Say we’re 13.8 billion years old with confidence, and now you know how we’ve figured it out! If you ask a scientist where the Universe got its start, “the Big Bang” is the answer you’re most likely to get. Our Universe full of stars, galaxies and a cosmic web of large-scale structure, all separated by the vastness of empty space between them, wasn’t born that way and didn’t exist that way forever. Instead, the Universe came to be this way because it expanded and cooled from a hot, dense, uniform, matter-and-radiation-filled state with no galaxies, stars, or even atoms present at the start. Everything that exists in its current form today didn’t exist 13.8 billion years ago, and all of this was figured out during the past 100 years. But even with all this, there are a whole slew of facts most people — even many scientists — don’t quite get about it. Here are our top 10 facts about the Big Bang! …and it predicted the existence of gravitational waves, just confirmed a few months ago. But it also predicted that a Universe that was full of matter and static, or unchanging over time, would be unstable. Georges Lemaître at the Catholic University of Leuven, ca. 1933. Public domain image. Image credit: Robert P. Kirshner, PNAS, via http://www.pnas.org/content/101/1/8/F3.expansion. The red box indicates the extent of Hubble’s original data. 2.) Hubble’s discovery of the expanding Universe turned it into a serious idea. Although many scientists considered that the spiral nebulae in the sky were distant galaxies all on their own even before Einstein, it was Edwin Hubble’s work in the 1920s that showed this was not only true, but that the more distant a galaxy was, the faster it was receding away from us. This fact — Hubble’s Law, describing the expansion of the Universe — led to a very straightforward interpretation consistent with the Big Bang idea: if the Universe is expanding today, then it was smaller and denser in the past! 3.) The idea had been around since 1922, but was widely dismissed for decades. Soviet Physicist Alexandr Friedmann came up with the theory for it in 1922, when it was criticized by Einstein. Lemaître’s 1927 work was also dismissed by Einstein, and even after Hubble’s work in 1929, the idea that the Universe was smaller, denser, and more uniform in the past was only a fringe idea. But Lemaître added in the idea that the redshift of galaxies could be explained by this expansion of space, and that there must have been an initial “moment of creation” at the beginning, which was known as either the “primeval atom” or the “cosmic egg” for decades. Into what is the universe expanding NASA Goddard, Dana Berry. 4.) The theory rose to true prominence in the 1940s when it made a startling set of predictions. George Gamow, an American scientist who became enamored of Lemaître’s ideas, realized that if the Universe was expanding today, then the wavelength of the light in it was increasing over time, and therefore the Universe was cooling. If it’s cooling today, then it must have been hotter in the past. Extrapolating backwards, he recognized that there once was a time period where it was too hot for neutral atoms to form, and then a period before that where it was too hot for even atomic nuclei to forms. 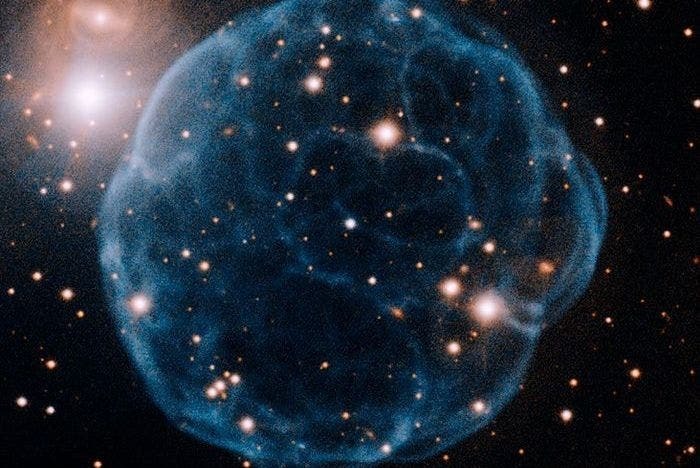 Therefore, as the Universe expanded and cooled, it must have formed the light elements and then neutral atoms for the first time, resulting in the existence of a “primeval fireball,” or a cosmic background of cold radiation just a few degrees above absolute zero. Fred Hoyle presenting a radio series, The Nature of the Universe, in 1950. Image credit: BBC. 6.) The 1964 discovery of the leftover glow from the Big Bang was initially thought to be from bird poop. In 1964, scientists Arno Penzias and Bob Wilson, working at the Holmdel Horn Antenna at Bell Labs, discovered a uniform radio signal coming from everywhere in the sky at once. Not realizing it was the Big Bang’s leftover glow, they thought it was a problem with the antenna, and tried to calibrate this “noise” away. When that didn’t work, they went into the antenna and discovered nests of pigeons living in there! They cleaned the nests (and droppings) of the pigeons out of there, and yet the signal remained. The realization that it was the discovery of Gamow’s prediction vindicated the Big Bang model, entrenching it as the scientific origin of our Universe. It also makes Penzias and Wilson the only Nobel-winning scientists to clean up animal poop as part of their Nobel-worthy research. 7.) The confirmation of the Big Bang gives us an explicit history for the formation of stars, galaxies, and rocky planets in the Universe. If the Universe started off hot, dense, expanding and uniform, then not only would we cool and form atomic nuclei and neutral atoms, but it would take time for gravitation to pull objects together into gravitationally collapsed structures. The first stars would take 50-to-100 million years to form; the first galaxies wouldn’t form for 150-250 million years; Milky Way-sized galaxies might take billions of years and the first rocky planets wouldn’t form until multiple generations of stars lived, burned through their fuel, and died in catastrophic supernovae explosions. It may not be a coincidence that we’re observing the Universe now, 13.8 billion years after the Big Bang; it might be that this is when the time is ripe for life on rocky worlds to emerge! 8.) The fluctuations in the cosmic microwave background tell us how close-to-perfectly uniform the Universe was at the start of the Big Bang. The cosmic microwave background is just 2.725 K today, but the fluctuations shown above are only around ~100 microKelvin in magnitude. The fact that the leftover glow from the Big Bang has slight non-uniformities of a particular magnitude at that early time tells us that the Universe was uniform to 1-part-in-30,000, but the fluctuations are what give rise to all the structure — stars, galaxies, etc. — that we see in the Universe today. 9.) The Big Bang itself doesn’t necessarily mean the very beginning anymore. It’s tempting to extrapolate this hot, dense expanding state all the way back to a singularity, as Lemaître did some 89 years ago. But there’s a suite of observations — led by the fluctuations in the primeval fireball — that teach us there was a different state prior to that, where all the energy in the Universe was inherent to space itself, and that space expanded at an exponential rate. This period was known as cosmic inflation, and we’re still researching the details on that. Science progresses farther and farther back, but so far, there’s no end in sight. Image credit: NASA & ESA, of possible models of the expanding Universe. 10.) And the way the Universe began doesn’t tell us the way it will end. Finally, the Big Bang tells us there was a race between gravity, trying to recollapse the expanding Universe, and the initial expansion, trying to drive everything apart. But the Big Bang on its own doesn’t tell us what the fate will be; that takes knowing what the entire Universe is made out of. With the existence of dark energy, discovered just 18 years ago, we’ve learned that not only will the expansion win, but that the most distant galaxies will continue to speed up in their recession from us. Our cold, lonely, empty fate is what we get in a dark energy Universe, but if the Universe were born with just a tiny bit more matter or radiation than what we have today, our fate could’ve been very different! To look out at the night sky and marvel at the seemingly endless canopy of stars is one of the oldest and most enduring human experiences we know of. Since antiquity, we’ve gazed towards the heavens and wondered at the faint, distant lights in the sky, curious as to their nature and their distance from us. As we’ve come to more modern times, one of our cosmic goals is to measure the distances to the faintest objects in the Universe, in an attempt to uncover the truth about how our Universe has expanded from the Big Bang until the present day. Yet even that lofty goal depends on getting the distances right to our nearest galactic neighbors, a process we’re still refining. We’ve taken three great steps forward in our quest to measure the distance to the stars, but we’ve still got further to go. The story starts in the 1600s with the Dutch scientist, Christiaan Huygens. Although he wasn’t the first to theorize that the faint, nighttime stars were Suns like our own that were simply incredibly far away, he was the first to attempt to measure their distance. An equally bright light that was twice as far away, he reasoned, would only appear one quarter as bright. A light ten times as distant would be just one hundredth as bright. And so if he could measure the brightness of the brightest star in the night sky — Sirius — as a fraction of the brightness of the Sun, he could figure out how much more distant Sirius was than our parent star. He began by drilling holes in a brass disk, allowing just a tiny pinhole of sunlight through, then comparing the apparent brightness with the observed brightness of the stars at night. Even the smallest hole he could possibly manufacture resulted in a blip of sunlight that far outshone all the stars, so he additionally masked it with beads of varying opacities. Finally, he calculated, after reducing the brightness of the Sun by a factor of approximately 800 million, the brightest star in the sky, Sirius, must be 28,000 times as distant as the Sun. That would place it 0.44 light years away; if only Huygens knew that Sirius was intrinsically 25.4 times as bright as our Sun, he could have come up with a reasonably good distance estimate just from this most primitive of methods. The concept of stellar parallax, where an observer at two different vantage points sees a foreground object shift. Image credit: public domain work from Srain at English Wikipedia. In the 1800s, we made another huge leap forward. The combination of heliocentrism — or the notion that the Earth orbited the Sun — combined with improvements in telescope technology enabled us to consider, for the first time, directly measuring the geometrical distance to one of these stars. No assumptions about what type of star it was, or about its luminous properties, were required any longer. Instead, the same math that enables you to hold your thumb at arm’s length, close one eye and then switch eyes and watch your thumb appear to shift, allowed us to measure the distances to the stars. Known as parallax, the fact that our planet’s orbit is some 300 million kilometers in diameter around the Sun means that if we view the stars today versus six months from now, we’ll see the closest stars appear to shift position in the sky relative to the other, more distant stars. By measuring how a star’s apparent position appeared to shift over an Earth year, in a periodic pattern, we could simply construct a triangle and figure out its distance from us. Beginning with Friedrich Bessel in 1838, who measured the star 61 Cygni, and immediately followed by Friedrich Struve and Thomas Henderson, who measured the distance to Vega and Alpha Centauri, respectively. (Interestingly, Henderson could have been the first to get there, but he was afraid his data was wrong, and so he sat on it for years until Bessel eventually scooped him!) This was a more direct method that led to much more accurate results. But even this came with problems. An example/illustration of gravitational lensing, and the bending of starlight due to mass. Image credit: NASA / STScI, via http://hubblesite.org/newscenter/archive/releases/2000/07/image/c/. Because the 20th century brought with it the physics of General Relativity, and a revolution all its own. The realization that mass itself caused curvature in the fabric of spacetime meant that the locations of the different masses — both in our Solar System and beyond — warped the apparent positions of these stars in different ways as the months and years ticked by. Although the warping is incredibly small, the differences in positions are tiny: minuscule fractions of a thousandth of a degree. Understanding this bending of starlight helps us obtain more accurate results than simple geometric parallax alone, but our lack of a complete mass map of the Solar System and galaxy makes this a difficult undertaking. An illustration of the cosmic distance ladder, starting with individual Cepheid variable stars. Image credit: NASA, ESA, and A. Feild (STScI). Today, our understanding of the expanding Universe depends extraordinarily precisely on measuring cosmic distances. Yet the closest rungs on that cosmic distance ladder, for star like Cepheid variables within our own galaxy, are dependent on this parallax method. If there’s an error of just a few percent on those measurements, then those errors will propagate all the way to the greatest distances, and this is one potential resolution to the tensions in the measurements of the Hubble constant. We’ve come a long way in measuring cosmic distances to an incredible precision, but we’re not 100% certain that our best methods are as accurate as we need them to be. Perhaps, after four centuries of trying to measure how far away the nearest stars truly are, we still have farther to go. The concept art of a solar sail (Japan’s IKAROS project) at a distant planet or star system. Image credit: Andrzej Mirecki of Wikimedia Commons, under a c.c.a.-s.a.-3.0 license. It’s certainly worth considering. Let’s take a look at the idea. Two coins: one showing heads and the other showing tails. Image credit: United States Mint, public domain. By creating two entangled photons from a pre-existing system and separating them by great distances, we can know information about the state of one by measuring the state of the other. Image credit: Melissa Meister, of laser photons through a beam splitter, under c.c.-by-2.0 generic, from https://www.flickr.com/photos/mmeister/3794835939. So now to Olivier’s question: could we use this property — quantum entanglement — to communicate from a distant star system to our own? The answer to that is yes, if you consider making a measurement at a distant location a form of communication. But when you say communicate, typically you want to know something about your destination. You could, for example, keep an entangled particle in an indeterminate state, send it aboard a spacecraft bound for the nearest star, and tell it to look for signs of a rocky planet in that star’s habitable zone. If you see one, make a measurement that forces the particle you have to be in the +1 state, and if you don’t see one, make a measurement that forces the particle you have to be in the -1 state. Image credit: European Gravitational Observatory, Lionel BRET/EUROLIOS. If you looked out at the Sun across the 93 million miles of space that separate our world from our nearest star, the light you’re seeing isn’t from the Sun as it is right now, but rather as it was some 8 minutes and 20 seconds ago. This is because as fast as light is — moving at the speed of light — it isn’t instantaneous: at 299,792.458 kilometers per second (186,282 miles per second), it requires that length of time to travel from the Sun’s photosphere to our planet. But gravitation doesn’t necessarily need to be the same way; it’s possible, as Newton’s theory predicted, that the gravitational force would be an instantaneous phenomenon, felt by all objects with mass in the Universe across the vast cosmic distances all at once. Image credit: NASA/JPL-Caltech, for the Cassini mission. But is that right? If the Sun were to simply wink out of existence, would the Earth immediately fly off in a straight line, or would it continue orbiting the Sun’s location for another 8 minutes and 20 seconds? If you ask General Relativity, the answer is much closer to the latter, because it isn’t mass that determines gravitation, but rather the curvature of space, which is determined by the sum of all the matter and energy in it. If you were to take the Sun away, space would go from being curved to being flat, but that transformation isn’t instantaneous. Because spacetime is a fabric, that transition would have to occur in some sort of “snapping” motion, which would send very large ripples — i.e., gravitational waves — through the Universe, propagating outward like ripples in a pond. Image credit: Sergiu Bacioiu from Romania, under c.c.-2.0 generic. The speed of those ripples is determined the same way the speed of anything is determined in relativity: by their energy and their mass. Since gravitational waves are massless yet have a finite energy, they must move at the speed of light! Which means, if you think about it, that the Earth isn’t directly attracted to the Sun’s location in space, but rather to where the Sun was located a little over 8 minutes ago. Image credit: David Champion, Max Planck Institute for Radio Astronomy. If that were the only difference between Einstein’s theory of gravity and Newton’s, we would have been able to instantly conclude that Einstein’s theory was wrong. The orbits of the planets were so well studied and so precisely recorded for so long (since the late 1500s!) that if gravity simply attracted the planets to the Sun’s prior location at the speed of light, the planets’ predicted locations would mismatch severely with where they actually were. It’s a stroke of brilliance to realize that Newton’s laws require an instantaneous speed of gravity to such precision that if that were the only constraint, the speed of gravity must have been more than 20 billion times faster than the speed of light! But in General Relativity, there’s another piece to the puzzle that matters a great deal: the orbiting planet’s velocity as it moves around the Sun. The Earth, for example, since it’s also moving, kind of “rides” over the ripples traveling through space, coming down in a different spot from where it was lifted up. It looks like we have two effects going on: each object’s velocity affects how it experiences gravity, and so do the changes that occur in gravitational fields. Image credit: LIGO/T. Pyle, of a model of distorted space in the Solar System. What’s amazing is that the changes in the gravitational field felt by a finite speed of gravity and the effects of velocity-dependent interactions cancel almost exactly! The inexactness of the cancellation is what allows us to determine, observationally, if Newton’s “infinite speed of gravity” model or Einstein’s “speed of gravity = speed of light” model matches with our Universe. In theory, we know that the speed of gravity should be the same as the speed of light. But the Sun’s force of gravity out here, by us, is far too weak to measure this effect. In fact, it gets really hard to measure, because if something moves at a constant velocity in a constant gravitational field, there’s no observable affect at all. What we’d want, ideally, is a system that has a massive object moving with a changing velocity through a changing gravitational field. In other words, we want a system that consists of a close pair of orbiting, observable stellar remnants, at least one of which is a neutron star. As one or both of these neutron stars orbit, they pulse, and the pulses are visible to us here on Earth each time the pole of a neutron star passes through our line-of-sight. The predictions from Einstein’s theory of gravity are incredibly sensitive to the speed of light, so much so that even from the very first binary pulsar system discovered in the 1980s, PSR 1913+16 (or the Hulse-Taylor binary), we have constrained the speed of gravity to be equal to the speed of light with a measurement error of only 0.2%! That’s an indirect measurement, of course. We were able to do another type of indirect measurement in 2002, when a chance coincidence lined up the Earth, Jupiter, and a very strong radio quasar (QSO J0842+1835) all along the same line-of-sight! As Jupiter moved between Earth and the quasar, the gravitational bending of Jupiter allowed us to measure the speed of gravity, ruling out an infinite speed and determining that the speed of gravity was between 2.55 × 10^8 and 3.81 × 10^8 meters-per-second, completely consistent with Einstein’s predictions. The quasar QSO J0842+1835, whose path was gravitationally altered by Jupiter in 2002, allowing an indirect confirmation that the speed of gravity equals the speed of light. Image credit: Fomalont et al. (2000), ApJS 131, 95-183, via http://www.jive.nl/svlbi/vlbapls/J0842+1835.htm. Ideally, we’d be able to measure the speed of these ripples directly, from the direct detection of a gravitational wave. LIGO just saw the first one, after all! Unfortunately, due to our inability to correctly triangulate the location from which these waves originated, we don’t know from which direction the waves were coming. By calculating the distance between the two independent detectors (in Washington and Louisiana) and measuring the difference in the signal arrival time, we can determine that the speed of gravity is consistent with the speed of light, but can only place an absolute constraint that it’s equal to the speed of light within 70%. The gravitational wave arrival at the two detectors in WA and LA, with an uncertain origin to their direction. Image credit: Diego Blas, Mikhail M. Ivanov, Ignacy Sawicki, Sergey Sibiryakov, via https://arxiv.org/abs/1602.04188. Still, it’s the indirect measurements from very rare pulsar systems that give us the tightest constraints. The best results, at the present time, tell us that the speed of gravity is between 2.993 × 10^8 and 3.003 × 10^8 meters per second, which is an amazing confirmation of General Relativity and a terrible difficulty for alternative theories of gravity that don’t reduce to General Relativity! (Sorry, Newton!) And now you know not only what the speed of gravity is, but where to look to figure it out! Image credit: Tomasz Barszczak, via http://www.ps.uci.edu/~tomba/sk/tscan/compare_mu_e/. They won this year’s Nobel Prize in Physics, but their legacy’s just beginning. What initial conditions the Universe starts off with. If you give a scientist all of those things and an arbitrary amount of calculational power, they can reproduce the entirety of the Universe we experience today, limited only by the quantum uncertainty inherent to our experience. In the 1960s, what we generally know as the Standard Model of elementary particles and their interactions came about, describing six quarks, three charged leptons, three massless neutrinos, along with the single photon for the electromagnetic force, the three W-and-Z bosons for the weak force, the eight gluons for the strong nuclear force, and the Higgs boson alongside them, to give mass to the fundamental particles in the Universe. Along with gravity, which is governed by Einstein’s general relativity, this accounts for the full suite of behavior of every individual particle ever directly detected. or where dark energy comes from. But for the particles that we have, the Standard Model does it all. Or rather, the Standard Model did it all, until we started looking closely at the almost invisible signals coming from the Sun: the neutrinos. The Sun is powered by nuclear fusion, where hydrogen nuclei are fused together at the tremendous temperatures and energies in the Sun’s core into helium. In the process, they emit large amounts of energy in the form of photons, and also energetic neutrinos. For every four protons that you fuse into a helium nucleus — the net result of fusion in the Sun — you produce two neutrinos. 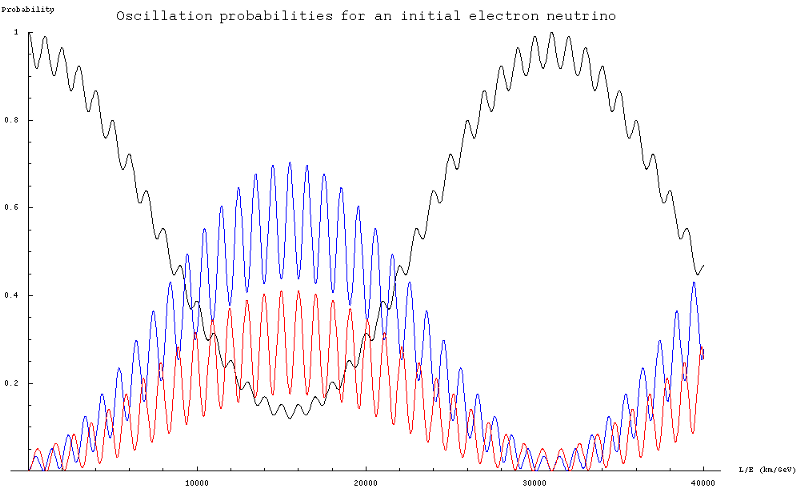 More specifically, you produce two anti-electron neutrinos, a very specific flavor of neutrino. Yet when we compute how many neutrinos ought to be produced, and we calculate how many we ought to be able to observe on Earth given our current technology, we only see about a third of the expected number: around 34%. Throughout the 1960s, 70s, 80s and 90s, most scientists lambasted either the experimental procedures used to detect these neutrinos, or decried the model of the Sun, claiming that something must be wrong. Yet as both theory and experiment improved, these results held up. It was almost like the neutrinos were disappearing, somehow. There was a radical theory proposed, however: that there was some new physics beyond the Standard Model that was at play, giving a tiny but non-zero mass to all the neutrinos, which would allow them to mix together. When they pass through matter and interact — ever so slightly — with it, this mixing enabled one flavor of neutrino (electron, muon or tau) to oscillate into a different one. Image credit: Wikimedia Commons user Strait. It was only when we gained the capabilities to detect these other flavors of neutrino, at both Super-Kamiokande and the Sudbury Neutrino Observatory, that we learned that these neutrinos weren’t missing after all, but were transforming from one flavor (the electron-type) into another (the muon or tau type)! We now know that all the neutrinos generated are electron (anti)neutrinos, but by time they reach us on Earth, they’re split ⅓, ⅓, ⅓ between the three flavors. Moreover, we’ve measured their masses from these experiments, determining that they’re somewhere between about 1 and a few hundred milli-electron-Volts, or less than one millionth the mass of the next-lightest particle: the electron. Image credit: Hitoshi Murayama of http://hitoshi.berkeley.edu/. Yes, neutrinos oscillate from one flavor to another, and yes, they have mass. But the real reason it matters is this: for the first time, we have evidence that the particles in the Standard Model — the known, discovered particles in the Universe — have properties that aren’t described by the Standard Model at all! There’s more physics out there to be discovered, and this is the first clue of what it might be. So while high energies and the LHC haven’t seen any signs of it, the lowest mass particles show us that there’s more out there than we currently know. And that’s a mystery that’s only expected to deepen the more closely we look. “Where did it come from” is pretty high up there! and even to where the energy density was so high that matter/antimatter pairs were spontaneously created from pure energy. You might think we could go all the way back even farther, to the very birth of space and time themselves. That was, in fact, the original idea of the Big Bang, but thanks to some spectacular observations, we know that isn’t quite how our Universe began. Above is the earliest known “baby picture” of our Universe. When the Universe finally did cool enough to stably form neutral atoms, all the radiation from the earliest times could suddenly travel through space, in a straight line, without being absorbed, re-emitted or scattered off of a free, charged particle. This radiation then had its wavelength stretched by the expansion of the Universe, where it can now be found at microwave frequencies: the Cosmic Microwave Background (CMB), or the leftover glow from the Big Bang. When we look at the fluctuations in it — or the slight imperfections from a perfectly uniform temperature at various locations across the sky — we can use what we know about physics and astrophysics to teach us a number of very important things. One of the things we can learn is that our Universe is made up of about 5% normal (atomic) matter, 27% dark matter and 68% dark energy. But no less important is this: we learn that these imperfections were initially the same on all scales, and are of such a small magnitude that the Universe couldn’t have achieved an arbitrarily high temperature in the distant past. Instead, there must have been a phase before the Universe was hot, dense and matter-and-radiation filled that set it all up. Originally conceived by Alan Guth in 1979, this phase — known today as cosmic inflation — solves a number of major problems with the Universe: stretching it flat, giving it the same temperature everywhere, eliminating high-energy relics and defects (like magnetic monopoles) from the Universe, and providing a mechanism to generate those much-needed fluctuations. Image credit: National Science Foundation (NASA, JPL, Keck Foundation, Moore Foundation, related) — Funded BICEP2 Program; modifications by E. Siegel. The fluctuations are remarkable in particular, because two distinct types of them — density (scalar) fluctuations and gravitational wave (tensor) fluctuations — were both predicted by inflation before the evidence for either one existed. As of today, we’ve not only directly observed the scalar ones and have strict limits on the tensor ones, but we’ve measured what the spectrum of these initial fluctuations were, which tells us something about the various types of inflation that could have occurred. In general, you can visualize inflation as a ball rolling down any type of hill you can imagine, into a valley. Image credit: E. Siegel, of three “hills-and-valleys” potentials that could describe cosmic inflation. Created with Google’s graph tool. 1. The fluctuations can be more important on small scales or on large ones, and by measuring the full spectrum of them, we can know what the slope of that hill was when inflation came to an end. 2. If we can measure the gravitational wave fluctuations and compare them to the density fluctuations, we can reconstruct how the slope was changing when inflation ended. In other words, we can “cook up” any model for inflation that we like, but only some of them will give us the right values — that match our Universe — for these two different types of fluctuations. Various models of inflation and what they predict for the scalar (x-axis) and tensor (y-axis) fluctuations from inflation. Image credit: Planck Collaboration: P. A. R. Ade et al., 2013, A&A preprint, with additional annotations by E. Siegel. Thanks to the Planck spacecraft, we now have very tight restrictions on the density fluctuations, disfavoring many of the simplest models. As superior (polarization) data from projects like Planck, BICEP, POLARBEAR and others continues to come in, hope that we’ll either detect the gravitational wave signatures or set stronger limits than ever before rises even higher. People have argued for a long time that cosmic inflation has too many solutions, but the better we get at making these measurements, the more hope we have that the number of solutions will eventually be reduced to one unique one. The Universe has a great story to tell us about its origin, to the limits of what we can conceivably measure. The better we get at actually making those measurements, the better we can understand how it all got its start. Cosmic inflation is almost definitely the answer to what happened before the Big Bang. But what was cosmic inflation like? We’re closer than ever to actually coming up with the answer.